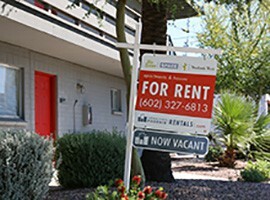 Arizona landlords will have the ability to evict tenants’ guests for any reason without notice if the governor signs a bill on his desk, opponents of the legislation say. Sen. Gail Griffin, R-Hereford, introduced the bill after a renter in her district had trouble with a guest who had stayed at the residence for several months. When the tenant asked the guest to leave, the man refused, said Adam Chodorow, a professor at the Sandra Day O’Connor College of Law at Arizona State University who has reviewed the bill. Police told the landlord the unwanted guest had taken up residency, meaning the guest was there for so long ¬– and had furniture and personal belonging at the rental ¬– that the man became a de facto tenant. Police could not remove him without an eviction notice, Chodorow said. The William E. Morris Institute for Justice, a Phoenix-based nonprofit advocacy group, is working to stop SB 1185 from becoming law by asking the governor to veto it. The bill got to the governor’s desk in the form of a “striker” amendment, which means the original bill’s language was replaced with this one. Because of that, this issue didn’t have the full debate other bills do. The bill’s sponsors, Griffin and Rep. Justin Olson, R-Mesa, did not return requests for comment. The Arizona Multihousing Association, which supported the bill during the legislative process, also did not return requests for comment. Officials with the institute said the bill would allow landlords to kick out guests for arbitrary reasons. The landlord has a vested interest in removing unwanted guests from their property, Chodorow said. But the question arises: Where do you draw the line between tenant and landlord rights? “The bill seems to draw the line far on the side of landlords, which opens up to interference,” Chodorow said. Opponents said the language is too broad, and they said landlords could kick out short-term guests, such as family, friends, or domestic help, without explanation. Griffin, a real estate broker, told the House Appropriations Committee on March 25 that tenants should get permission from their landlord to have guests for extended periods, and “there shouldn’t be a problem” adding the person to the written lease. The bill’s language states that if either the landlord or the tenant does not give permission for the guest to stay, they can be removed no matter the length of their stay or reason for the visit. Opponents said that means every guest can be removed if the landlord refuses permission. The problem over removing unwanted long term guests is already covered in leases that specify the number of days guests can to stay without landlord approval, Katz said. The Arizona Residential Landlord and Tenant Act states that a tenant is responsible for the “actions of their guests that violate the lease agreement or rules or regulations of the landlord.” If a guest violates the lease, the landlord can give notice to the tenant and eventually evict them. A major difference between the landlord and tenant act and SB 1185 is the bill doesn’t require landlords or tenants to warn guests prior to eviction, opponents said. SB 1185 could give Arizona landlords the ability to evict tenants’ guests for any reason without notice, bill opponents said.